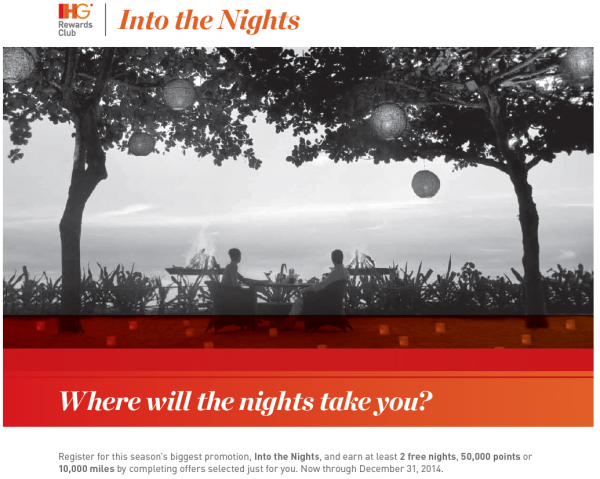 IHG Rewards Club is about to launch its next global promotion called “Into The Nights”. This is the third version of the Big Win and valid for stays between September 4 and December 31, 2014. IHG Rewards Club members will receive personalized offer based on their recent stay history with IHG. You can earn minimum of 2 free nights, 50,000 bonus points or 10,000 airline miles. You can find your personalized offer starting on September 4 from here (note that the link doesn’t resolve yet). Once the registration is open, I will have another post up where LoyaltyLobby readers can post their personalized offers, so that we can compare them. You can find many fall 2013 offers on my post here and spring 2014 ones here. ATLANTA (Sept. 4, 2014) – InterContinental Hotels Group (IHG) is kicking off the fall travel season by offering IHG® Rewards Club members more opportunities to earn toward free travel through its next hotel rewards promotion, “Into the Nights.” The promotion offers members at least two free hotel nights at any IHG®-branded hotel anywhere in the world including InterContinental® Hotels & Resorts, Crowne Plaza® Hotels & Resorts, Hotel Indigo® Hotels, Holiday Inn® Hotels, Holiday Inn Resort® Hotels, Holiday Inn Club Vacations®, Holiday Inn Express® Hotels, Staybridge Suites® Hotels, Candlewood Suites® Hotels and EVEN™ Hotels once a tailored set of offers is complete. “Into the Nights” hotel rewards promotion at www.ihg.com/freenights. Members can track their offers and rewards via a customized Rewards Tracker at www.ihg.com/freenights. This is indeed the same promotion that I wrote about yesterday (read more here), but Lufthansa had got the start date wrong. In the past couple of Big Wins, the targeted offers varied greatly based on your recent stays with IHG. Some offers were great and some almost unattainable. I have stayed a lot at IHG as of late, so I would imagine my version require 20 to 30 paid nights between September 4 and December 31, 2014. Remember to come back here once the registration is open, so that we can compile a list of all targeted offers out there.